From the Baldwin County Courthouse, go west on Hancock Street for 2 blocks or 0.2 mile (or the one large block containing Georgia College & State Univ.). Turn right on Clarke Street. Go one large block or 0.2 mile. Turn left onto Business Highway 441 North (Montgomery St.) and follow the signs for Business 441 N (turn right on North Columbia St.). The cemetery is 2.9 miles from the Courthouse. Turn left into the parking lot that is on the north side of Hatcher Square Mall. 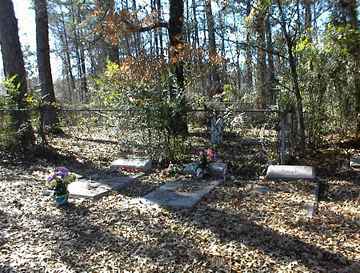 The cemetery is about 200 yards from Highway 441 on a rise overlooking the mall and its parking lot. It is not readily seen from the parking lot. b. Milledgeville, d. Athens, Ga. "our beloved nurse"